He's literally driving off in this pic, quickly. That's the plywood he dumped, right center. 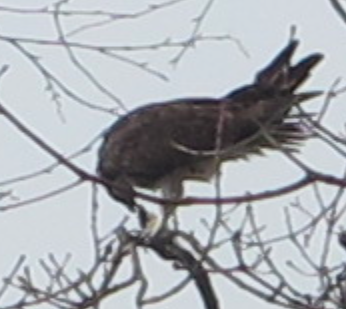 The second item, my friends, is an osprey I caught with my lens on Sunday morning . 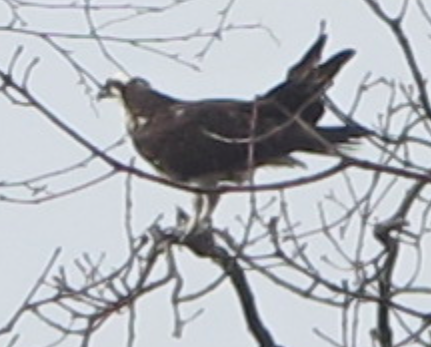 It was huge, much bigger than the hawks I've seen around here. Anyway, here's the video where it catches my eye. For reference, it mostly stays in the center or the frame. You may need to replay it to see the whole flight; it ends landing on a branch where it eats a fish it had in its talons! Apparently it's diet is almost exclusively fish. 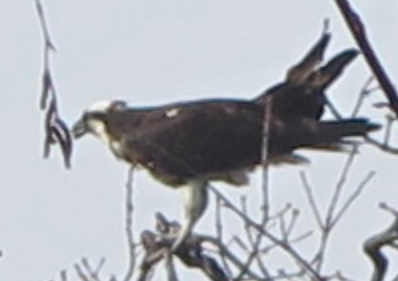 The next video is of the osprey eating its prey on the branch. Mohegan Lake is a pretty amazing place. Lots of fish in its waters, as we--and this osprey--know. Below are some highly enlarged and zoomed in on photos. I'm still excited about them though. 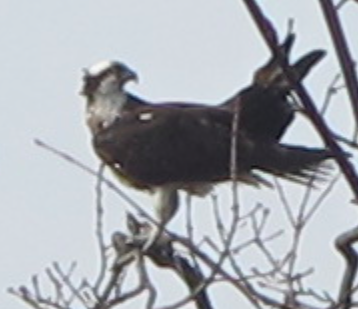 You can still see what a regal raptor the osprey is.